Today we have a couple of renders showcasing some equipment that you will be able to find on our upcoming map Pegasus, as well as an announcement from the guys over at Forgotten Honor. You might perhaps have seen them in the stream, which is available on Youtube. They are of course the Sten Mk.V and the SOMUA S35. Although French military thinking called for a defensive war, they recognised the need to be able to fight on the offensive as well. This job fell to the Cavalry, who in 1931 placed a request for a fast tank. By 1934, the request had been updated to be immune from contemporary anti tank guns. The Société d'Outillage Mécanique et d'Usinage d'Artillerie, or SOMUA for short, produced a series of prototypes in 1935, with an order for 50 following the next year. The tank was one of the first to make use of large cast sections for the hull, and was also fitted with the cast APX-1 turret from the Infantry's Char B1. The 47mm SA35 gun was more than able to defeat the PzIII and BT-7, and these contemporaries couldn't hope to harm the S35 in return. There were however several problems with the S35 that stopped it from being a war winner. It was expensive and time consuming to make, it had poor mechanical reliability, and the turret was both single manned and had no openable cupola, forcing the overworked commander to fight buttoned up. After the fall of France, about 100 S35 tanks were in Vichy hands while nearly 300 were captured by the Germans. Many of these captured tanks were put into service as Pz 35-S 739(f), where they served in Finland, Yugoslavia and a few were to be found in Normandy. Although hopelessly outclassed by 1945, 12 were still in use at the start of the year. 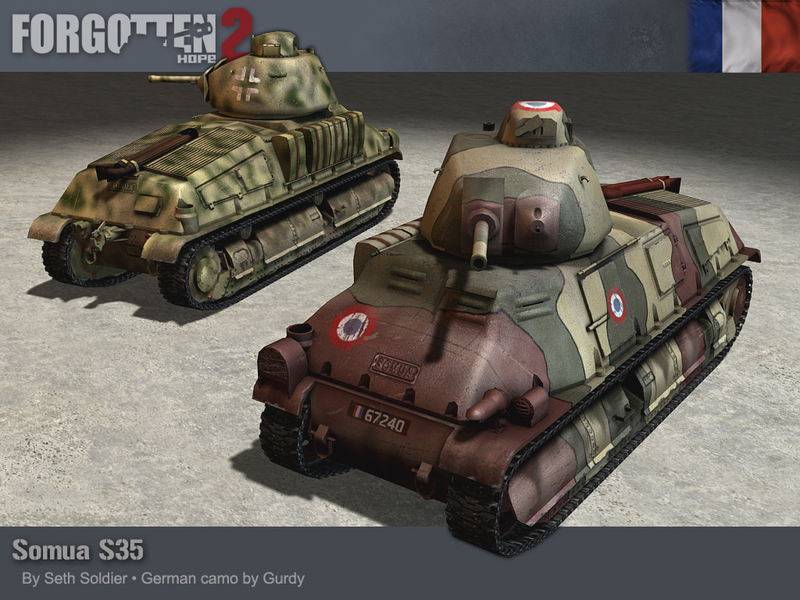 The S35 was made by Seth Soldier, and was repainted for German use by Gurdy. The Mk.V version of the Sten was little more than a better quality Mk.II with some cosmetic additions. A wooden stock and pistol grip replaced the steel skeleton stock, new front sights taken from the No.4 rifle were added and a rather flimsy wooden front handhold was clipped to the barrel shroud. 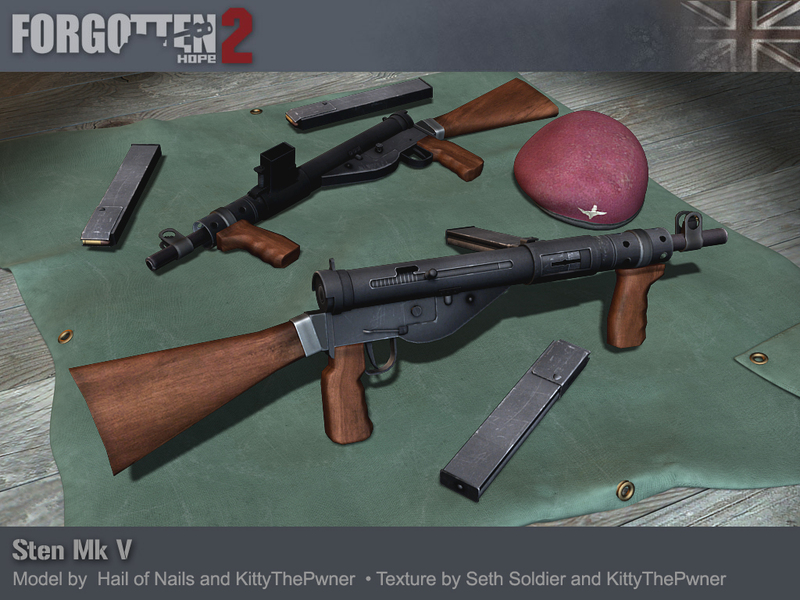 Our Sten Mk.V was made by KittyThePwner, who modified the original Mk.II model made by Hail of Nails and Seth Soldier. Forgotten Hope 2 Team Cup 2015 starts NOW! The Team Cup 2015 is even bigger, better and more intense than ever! After the success of previous editions of the Nations Cup we are happy to announce that we are soon opening the sign-ups for the Team Cup of 2015! We will use the great 16 layers of the Community Mappack, bringing new maps for many players! 1st matches are planned for the 13th Feb, followed each Friday for 3-4 weeks depending on the number of teams. This year the Team Cup is even bigger, stronger and better. With Forgotten Hope 2 players of all nationalities and communities playing together in teamwork based squads in a 3-4 week tournament style competition. We can ensure you will see a lot of action. Forgotten Hope 2 at its best! It is free and everybody is welcome! I want to Sign-Up, but how? Pressing the button below will link you to the platform being used for the TeamCup 2015 at www.forgottenhonor.com. If you are not registered yet, you will be asked to register on the website first before you go further. As soon you are registered you will see a list of several tournaments that Forgotten Honor is hosting. Search for the TeamCup 2015 tournament and hit 'Join this Game'. Choose a team or "Random" if you are not sure yet. After you are done you will see the Team Cup 2015 forums with helpful threads and posts. Forgotten Honor is an international gaming community that has a great amount of experience in arranging online events for games. Founded in 2004 by several players who wanted to organize "teamwork" emphasized battles for video games, Forgotten Honor has been growing until becoming one of the leaders in online events market. Nowadays hosts several tournaments and campaigns for different games, organizes multiple events, has its own modding development unit and is supported by an active community. Our winners for this week's screenshot competition is Matthew_Baker. You can view the winning submission here. We are now accepting entries for the week of December 29th. If you think you have the best FH2 screenshot, post them here.